For those of you Ashes: Rise of the Phoenixborn players out there, I've got some good news for you. 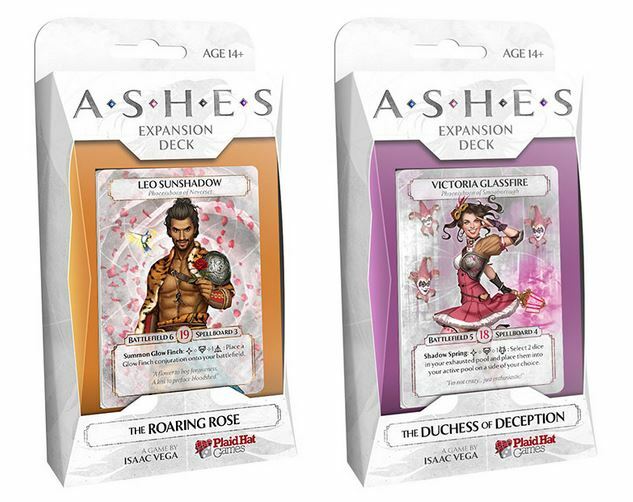 There's soon going to be more options available for your decks, as well as potential new opponents, as two new decks are available to pre-order from over in the Plaid Hat Games webshop. Leo Sunshadow helps you run through your opponent's deck using charms dice, as well as support your own units. There's also Victoria Glassfire, for those that like to see things that don't actually exist (that is to say, illusions). There's a special bonus when you order from Plaid Hat, directly, too. You can get the exclusive Orrick Gilstream (with ally Gobi Sunshield). You can also order Orrick separately, if you so choose.